Epitomising purist Tannoy design, the Precision 6.1 is a true point source loudspeaker. Featuring a single 150 mm (6) Precision Dual Concentric driver in a dedicated stand mount cabinet, this compact rear-ported loudspeaker delivers exceptional articulation and musical accuracy. Offering precise imaging and intimate detailing, the Precision 6.1 is ideal for the smaller listening room. 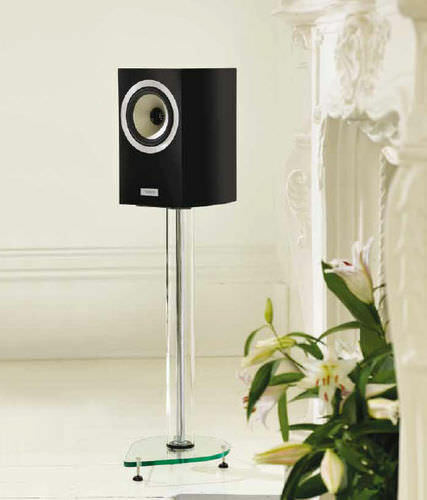 The Precision range combines Tannoys 85 years of loudspeaker design experience with modern high tolerance manufacturing to deliver outstanding accuracy and musical articulation. This luxury loudspeaker range is based on a new 150 mm (6) version of Tannoys world-renowned Dual Concentric driver with WideBand™ tweeter technology. Delivering exceptional bandwidth with extremely low colouration this innovative point source driver ensures faithful reproduction of the source information. Precision cabinets are truly unique, mixing acoustic engineering and aesthetic beauty in equal measure. The curved side panels reduce internal standing waves, reduce panel resonances and increase cabinet volume whilst still retaining a compact footprint. On the inside, precision engineering and precision performance is the root of this loudspeaker ranges name. For the cabinet, heavyweight fibreboard construction, unique architecture, complex bracing, Tannoys proprietary Differential Material Technology™ (DMT™) and a Mass Loading Cavity (MLC) draw heavily on Tannoys rich heritage in loudspeaker design. Precision crossovers are hand-built and hard wired from the finest components.